The regular use of sunscreen is a critical step for reducing the risk of developing skin cancer and preventing the premature aging of the skin caused by sun exposure. Despite what we know about the harmful effects of UV radiation from the sun, rising rates of skin cancer and actinic keratoses indicate that more people than ever are spending too much time in the sun without sufficient sun protection. Advances in sunscreen formulations make it easier than ever to use sunscreen each and every time you are out in the sun. Keep the following sunscreen tips in mind. Ultraviolet rays produced by the sun are categorized as UVA and UVB. UVA leads to AGING, and UVB leads to BURNING. Exposure to either type increases the risk of developing skin cancer. Unless the product label says it offers UVA protection, it probably doesn’t. You won’t get a sunburn on dark days or through glass, because clouds and glass block UVB rays. But UVA rays penetrates both. So if you are driving a car or working near a window, be sure to apply UVA protection to prevent premature aging of the skin. Look for these UVA-protective ingredients: avobenzone, oxybenzone, zinc oxide, and/or titanium dioxide. Brand names include Helioplex and Mexoryl. SPF, or “sun protection factor”, is a measurement of how much the sunscreen shields a person from ultraviolet B rays (UVB). These are the rays that cause sunburn. Sunscreen with an SPF of 30 offers protection from 96.7% of UVB rays, while sunscreen with an SPF of 50 offers protection from 98% of UVB rays. So sunscreens with an SPF over 30 provide only marginally greater protection. Use enough sunscreen to adequately cover all sun-exposed areas. Use one ounce (2-3 tablespoons) to cover the entire body. An 8-ounce bottle should last for only 8 applications (or only two rounds for a family of four). It takes time for sunscreens to interact with the skin sufficiently to start working. Sunscreens should be applied 20 minutes before sun exposure because they need this time to interact with the skin to work sufficiently. Recent reports have shown that the terms like water-resistant or waterproof are not reliable. The ultraviolet rays that can damage your skin can also destroy sunscreen so don’t rely on them to work all day. Most sunscreens in stores are “chemical sunscreens”. They use chemicals that interact with the skin to absorb UV radiation. “Physical sunscreens” use inert minerals to deflect or scatter the UV radiation, like microscopic mirrors. 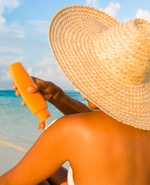 Common ingredients of “physical sunscreens” include zinc oxide, titanium dioxide, or iron oxide. Many formulations will combine these ingredients to provide a wide range of UV protection. Physical sunscreens are less likely to cause allergic reactions and they start working immediately once they are applied to the skin. This makes them useful options for children with sensitive skin or who are too impatient to wait before going out in the sun. Although past formulations were unsightly (often leaving a white film on the skin), newer "microfine" formulations are invisible after being applied. Microfine titanium dioxide is effective at protecting from both UVA and UVB rays. These products were once referred to as “sunblocks” but that terminology was thought to be misleading since they do not offer 100% protection and they too require regular re-application. Be especially diligent about avoiding sun exposure during peak hours, 10:00 am to 4:00 pm. Wear hats with wide brims all around to protect your head and neck. Consider UV-protective clothing. Normal clothing provides an SPF protection of only 6 to 15, which falls lower if wet. Some specialized fabrics can provide SPF protection of 30 or higher. Remember to protect your lips with lip balm containing sunscreen. Keep sunscreen in your car, purse, backpack, and sports bag, and with camping gear and gardening tools so you don’t forget to use it. Find a sunscreen that fits your budget so that you use it regularly, re-apply it often and are willing to share it with your family and friends. Sunscreen should be used regularly, lathered on liberally, and re-applied frequently. It should also be shared with family and friends. Find a sunscreen that fits your budget so that you use it frequently and freely.